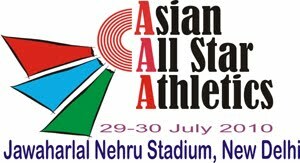 The 3rd Asian All Stars Athletics meet held on July 29-30, 2010 in New Delhi, India. As much as 250 athletes from 17 countries were taking part. The Asian All Stars Athletics was set to provide a competitive rivalry among the best athletes (junior and senior) from the whole Asian continental. Top Asian athlete Ehsan Hadidi who holds the continental record in discus throw (69.32m) was among the list of participants. A total prize money of USD 70,000 were distributed to the top three winners from the entire 25 events. Malaysia hurdler Mohd Ajmal Hassan delivered the only medal for the country when he suprisingly wins bronze in 110mh in 14.61. Malaysian Games champion P.Yuvaaraj hovewer could only finished 7th in the 400m with a time of 48.04, some way off his season best of 47.31. Middle distance runners, Mohd Jironi and Gantimathi failed to win in their respective events.